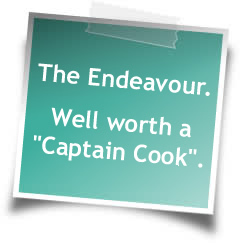 WHAT'S SO SPECIAL ABOUT THE ENDEAVOUR PRAWN? The Endeavour Prawn is an Aussie, spending its time relaxing off the coast of this nation girt by sea. It’s not the biggest or best looking prawn around. It’s not the most striking. To be honest, the Endeavour Prawn is a little ugly. Next to King Prawns and the beautifully marked Tiger, the Endeavour can appear a little undersized and unattractive. But this humble little crustacean is still very special, in fact, it's extraordinary. The Endeavour Prawn is the best tasting wild caught prawn in Australia. We know this because in February 2007 at the National Australian Prawn Fisheries Conference in Adelaide, the Endeavour Prawn won the industry taste-off against every commercially caught prawn in Australian waters. It is the deserving title holder of 2007's Australia's tastiest prawn. Truffles are pretty ugly, but still highly desired and only found on the tables of the fabulously wealthy. We'd like to think the Endeavour Prawn is the truffle of the prawn world. Not pretty, but a delicious treat to be savoured. So what else is there to know about Queensland Endeavours? of which the Blue is more common. They have a pale brown to pink body with a sliver of bright blue or red on the tail fin. They range in size from about 22-30g each ranging from 7-14cm in length. Red Endeavour Prawns are slightly smaller. WHERE DO WE CATCH THEM? Endeavour Prawns are caught wild in the pristine northern oceans of Australia. They can be found from southern NSW, around the northern coast of Australia through the Gulf of Carpenteria past the Northern Territory and all the way to Shark Bay, WA. The Endeavour Prawn dwells on sandy or muddy bottoms up to a depth of about 95m. The season generally runs from March to November. All Endeavour Prawns are caught at night by trawlers. Endeavour Prawns are not farmed. Endeavours represent about 50-60% of the catch in Northern Queensland waters, and that ratio reduces progressively towards southern waters. The Endeavour Prawn has a medium to strong flavour, which is generally sweet and the flesh has a firm texture. It has a low to medium oiliness and the flesh is translucent when raw and when cooked becomes white with pinkish bands. Thanks go to frdc.gov.au for the images on the right.